The answer to that question is simple, too. Seasons change. And when they do, plant behavior changes as well. Fortunately, there are a few simple tasks you can do to stay ahead of Mother Nature and work with her to ensure that your garden thrives throughout the summer. It is this type of partnership that will enable you to get the most out of your landscape in every season. Nature doesn’t take time off. During the summer, as the days get longer and lazier, it’s easy to get complacent, grab a refreshing drink, and sit in the shade. Now, there’s certainly nothing wrong with that, and it’s just that you need to remember that during all that time, things are happening in nature. Summer is characteristically the hardest season to manage with respect to the landscape. Why? Because summer heat and dryness can create significant stress in some plants while encouraging vigorous growth in others – mostly those that we don’t want – the weeds!! These extreme conditions can come on abruptly. One day everything is lush and moist and happy and then overnight everything is dried out. It does not feel gradual. It feels instantaneous. So why does it feel like this? Because summer’s hot, plants are thirsty, and there’s only so much water to go around at any given time. Think of it this way. During the active growing season, more water often moves up than it does down. Look at all the big plants, such as trees and shrubs, in your landscape. They’re like big straws stuck in the ground. All those roots, branches, and leaves are sucking water up from the soil, usually at a time when there’s little rain to replenish it. The bigger the leaves get and the more flowers that bloom translates into more water being removed from the soil systems. And like a bank account, if you make more withdrawals than deposits, the account dries up. The increased heat causes the plants to sweat, called transpiration. The plants are taking water from the soil system and move it up into the air system. This is why we quickly go from moist to dry. So how do we work with this natural change without merely pouring more water on the ground through hoses and irrigation systems? 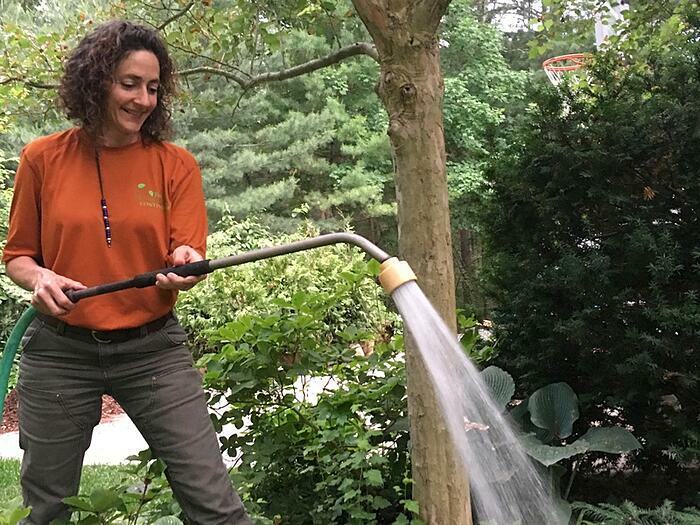 Of course, watering can be necessary for the short run, but if you find that watering doesn’t seem to help and you cannot keep up with the drying action, you have a fundamental underlying problem with your soil, and you’ll need to make some soil corrections in the coming fall and next spring. The middle of summer is NOT the time to start fiddling with your soil profile. 1) Mulch There are two reasons why we add mulch to the garden: it helps keep moisture in and weeds out. Mulch in the early spring to take advantage of the wet spring season so your soil can maintain even moisture. 2) Weed Start weeding early in the season to gain momentum and stay ahead of those pesky plants. Weeding early before they can flower and go to seed prevents them from spreading. 3) Prune Summer is when a lot of pruning will be needed because healthy plants have exploded with new growth. Spring blossoms are fading, and they are pushing foliage up and out. Always remember that pruning isn’t a “one method fits all plants” equation so do your plant research in advance. A little aside: People often ask me “how big will this plant get?” and I share that the real question is “how easy is this plant to prune?” because in truth, left unchecked, almost every plant will outgrow the space it was planted. Easy-to-prune plants are versatile enough to put almost anywhere while difficult-to-prune plants should be given more space to grow since cutting them back usually results in an ugly plant. 4) Add color Let’s face it -- spring spoils us. It’s the season when most of our trees and shrubs are flowering. So when we move into summer, we move into the green time of year. To keep the color going, you can do two things in the garden -- make sure you have layers of spring, summer, and fall-blooming perennials and add annuals to keep the color vibrant and strong right up until the fall. Not everyone can get behind the repeated work of adding annuals, but I for one love the color-kick they give in the garden and in planters. 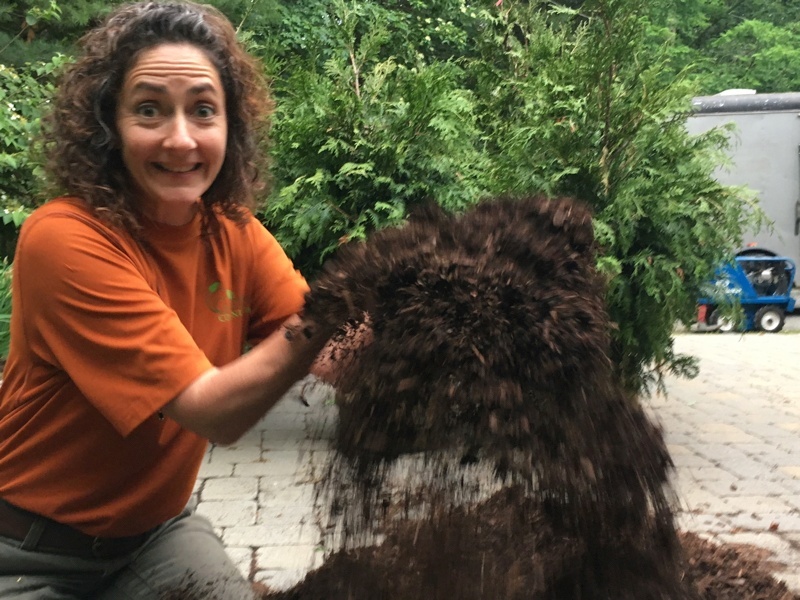 If you have the right plants in the right place with healthy garden soil, there are four things you can do to support your landscape throughout the summer months. “Spring ahead” is not just for daylight savings time. It’s good practice for gardening as well. As the owner of a landscaping company, I’m often charged with doing all that front-loaded spring work that helps homeowners have a strong start to summer. The early work accomplished helps keep the gardens moving from the short/cool/warm/moist days of spring into the long/hot/humid/dry days of summer. And guards against becoming overrun by weeds or crowded out by vigorous new growth. If you like to garden, working with a landscape company that can help you prepare for summer will enable you to garden at the pace you prefer without getting overrun and overgrown. Keep in mind that the weather can change at a moment’s notice, so keep those hoses at the ready so you can spot water and help your garden through the heat of summer.